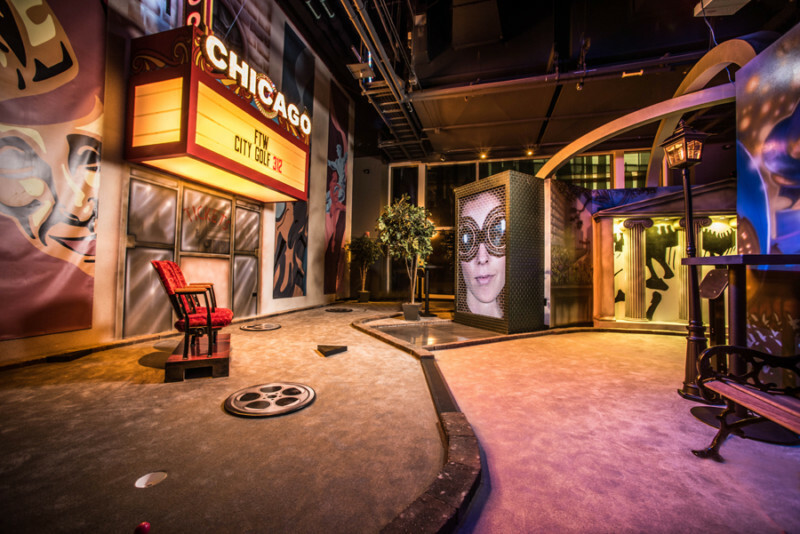 Chicago, IL, USA – A new entertainment facility opened its doors in Chicago’s Streeterville neighborhood in early June. FTW (For The Win) Chicago is a steampunk themed venue from Lucky Strike Entertainment, the company that helped change the bowling experience to what it is today. 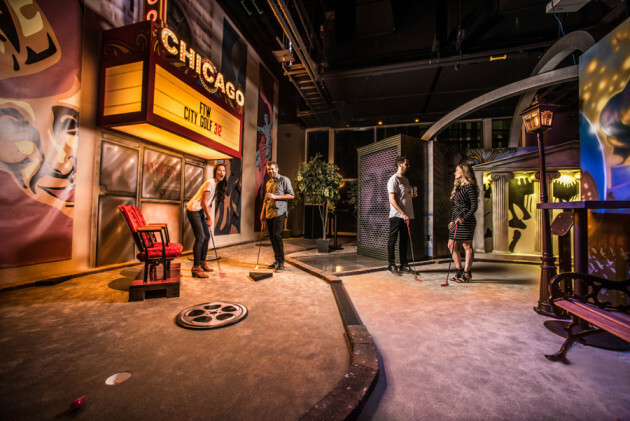 Visitors to FTW Chicago will find a plethora of social activities including a large arcade with over 130 new games and a bar that serves 32 craft beers on tap and offers food creations such as Belgian fries topped with braised short ribs and sour cream. 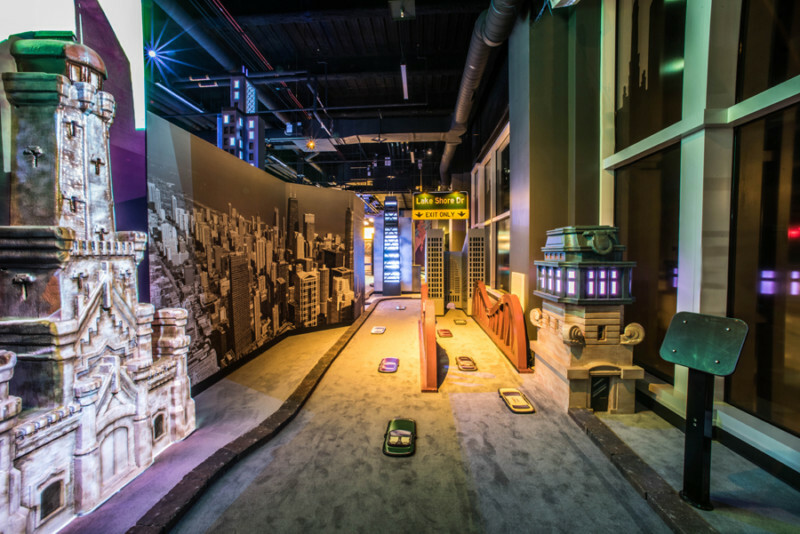 The highlight of FTW Chicago is City Golf 312, a six-hole miniature golf course custom built by Creative Works, Inc.
City Golf 312 takes players through a miniature walking tour of Chicago’s famous landmarks. According to Jim Bennington, Games & Redemption Manager, he wanted to “represent the city in a nutshell.” He accomplished that goal and more with visits to Wrigley Field, the Field Museum and the Chicago Theatre. Every hole highlights a landmark with highly detailed props and construction. “Everything has been hand crafted in this place to create a ‘wow,’ goose bumps,” said Steven Foster, CEO of Lucky Strike Entertainment. “Delivering the wow effect” is Creative Works’ vision statement so this project was an easy choice for the company. The highly skilled Creative Works design team that includes sculptors, painters, and architects made several trips to Chicago to ensure that no detail was missed on any of the landmarks. A replica of one of the iconic lion statues that sits in front of the Art Institute of Chicago took over 20 hours to sculpt. The team made sure that the heart and soul of the city was represented and both local guests and tourists have noticed. “Unlike anything anybody has done in the world ever,” added Foster. FTW Chicago is located adjacent to the Lucky Strike and AMC River East complex on 322 Illinois Street in Chicago.